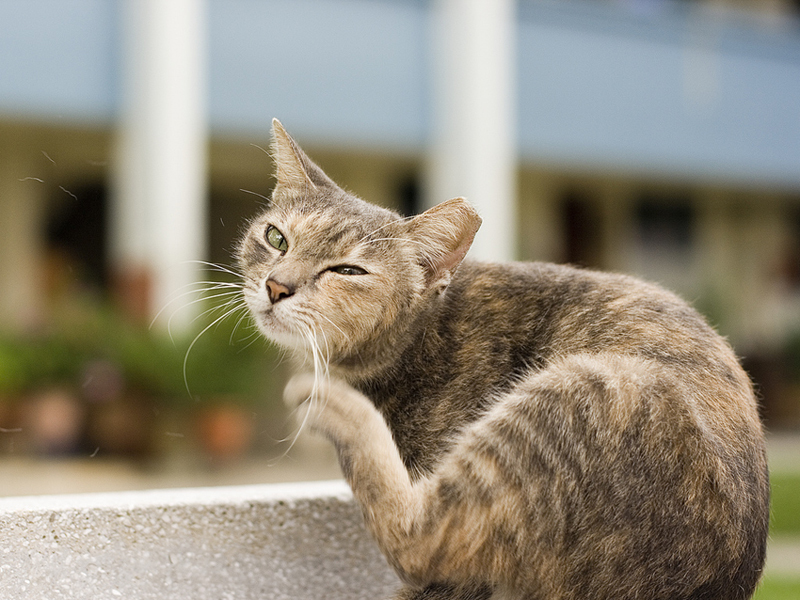 Ear mites in cats is one of the most common health problems that felines face. Ear mites (Otodectes cynotis) are tiny insects that live in the ear canal of the cat and feed by piercing the skin. They are prolific breeders and can be passed between cats and from mother to kittens as well. The most common sign of ear mites is an intense itching at the ears as well as violent head shaking. Cats can also suffer an allergic reaction to the mites, which will make the reaction even worse. You can also see dry, crumbly waxy brown discharges coming from the ear that looks a bit like ground coffee and has a really foul smell. The continued scratching can also cause raw areas, scabbing when blood is drawn and loss of hair in those areas and can even lead to a bacterial infection. A vet will establish the presence of ear mites by swabbing the ear and examining under a magnifying glass or from a sample of ear wax. Mites show as tiny white specks around the size of a pin head that move around. These mites can leave the ear canal and move around the body and can also transfer to other species such as dogs, rabbits and ferrets but never to humans. Because ear mites cause a lot of distress to a cat, they need to be treated quickly but can be a problem. They crawl into the ear canals to some depth and can lead to secondary infections. But it should always be diagnosed by a vet before starting treatment, as there are some other types of mites that can infect a cat’s ears. Normally treatment will involve cleaning out the ears as dirty canals containing wax and other debris can allow the mites to hide. Your vet will provide you with an ear treatment and how much and how often to make use of it. It is important to complete the course of medication even if there is no longer any signs of the mites because they can be hidden away. Ivermectin is another treatment option where sometimes a single subcutaneous injection is given or drops into the ear are used. When being treated, sometimes the mites may flee from the ears and take up residence on other parts of the body, causing itching and scratching in that area. Therefore, it is important to treat the whole of the cat with a topical insecticide preparation, which your vet will recommend to you. Make sure you treat even the tail as many cats curl up with ears on their tail and the mites may spread to the tail area to hide from treatment. During treatment, it can also be advisable to get your cat’s nails clipped a little to avoid them causing themselves injury with scratching that can lead to further infection. It is very difficult to entirely prevent your cat from getting ear mites as they are passed from one animal to another. But if your cat shows any signs of the infection, treatment as quick as possible can see the back of these horrible little pests. Previous post: Why Do Cats Hiss?